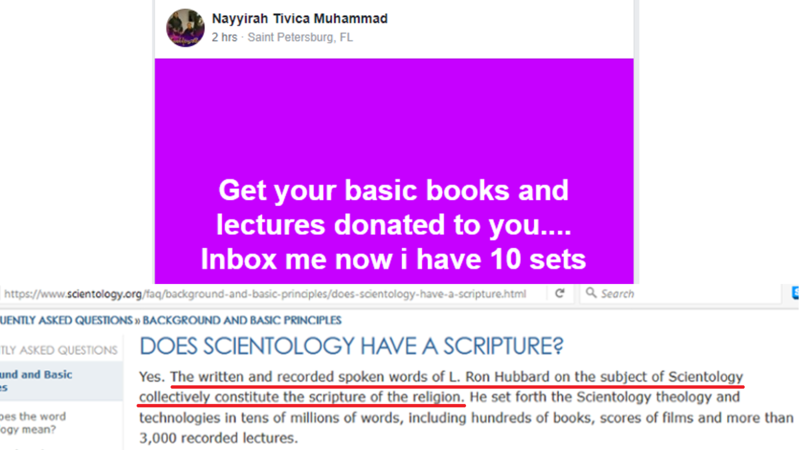 Nation of Islam Sister Nayyirah Tivica Muhammad has another ten sets of Scientology Scriptures to donate. This woman must be rich......they are going to bleed her dry eventually. Oh, yeah.....I forgot they do that. 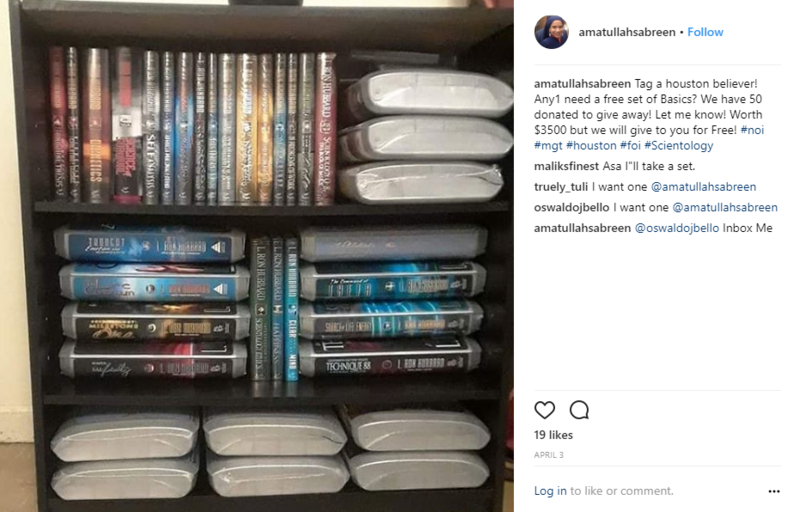 Sister Nyyirah's husband works for MGE mgt..
As of April 3, 2018, Nation of Islam Sister Amatullah Sabreen had FIFTY (50) sets of Scientology Scriptures to donate to members of the Nation of Islam FOR FREE. Each set is valued at $3,500. 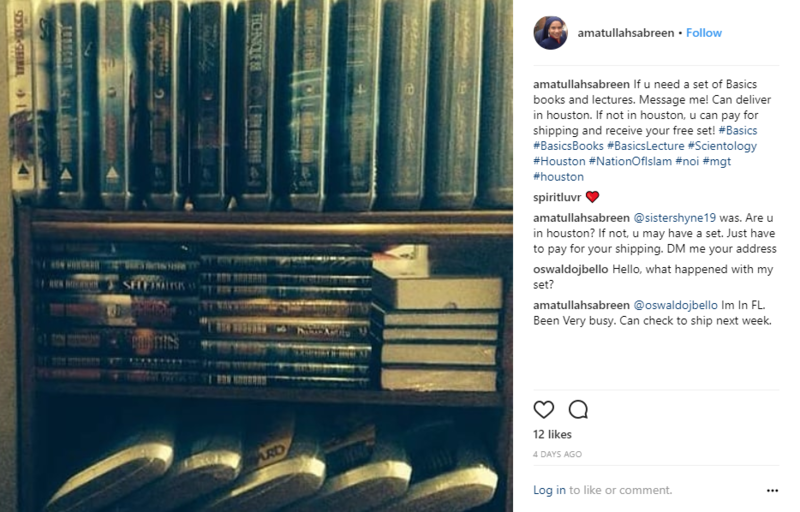 As of four days ago, Nation of Islam Sister Amatullah Sabreen was still donating free sets of Scientology Scriptures to members of the Nation of Islam. 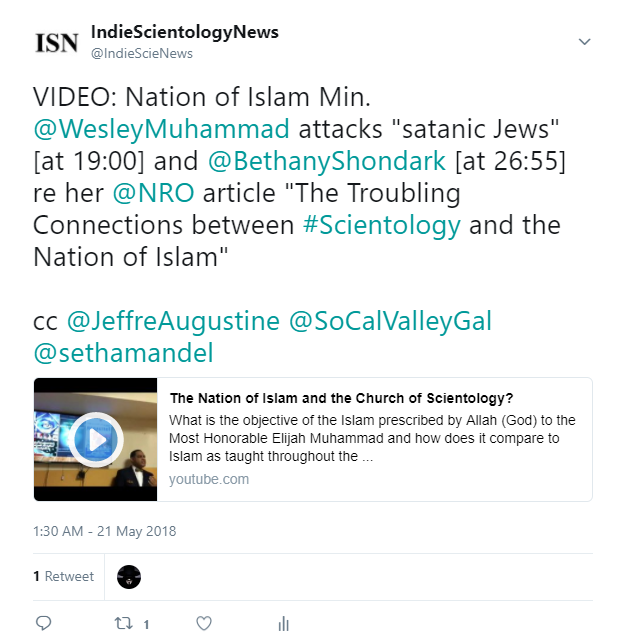 Nation of Islam Sister Amatullah Sabreen was kind enough to provide us with her notes from the First International Black Scientologists Convention, as well as for Rev. Alfreddie Johnson's Sunday Service at the convention. 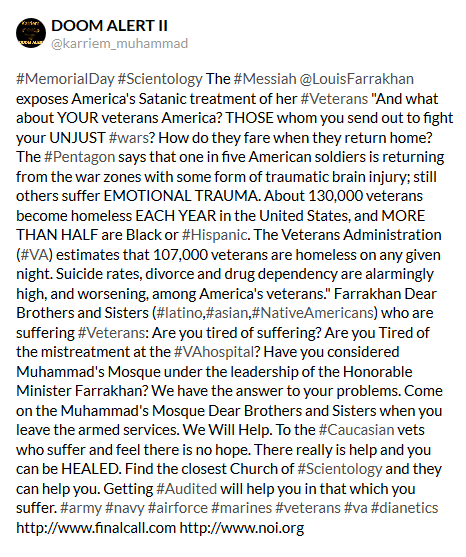 Edited to add: HMLF = Honorable Minister Louis Farrakhan. its freezes up and is difficult to watch on You Tube..
an part of the NOI's Research Group..Heh! 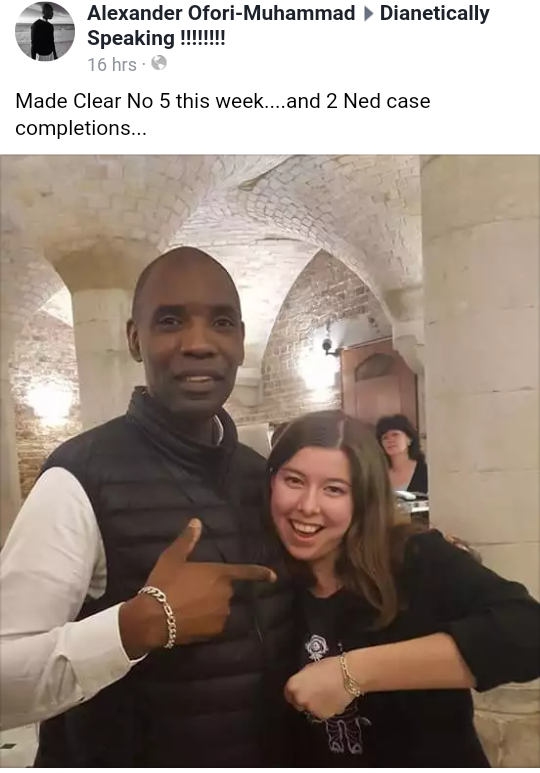 so they are sending Dr Wesley to quell the rumors..and hes traveling from Mosque to Mosque tell everyone Louie doesn't get a penny from Scientology..
its Time for an IRS audit..
cut the last 40 MINUTES INTO 4 VIDEOS..
VIDEO: Nation of Islam Minister Wesley Muhammad attacks "satanic Jews" [at 19:00] and Bethany Mandel [@BethanyShondark] [at 26:55] regarding her National Review Online article "The Troubling Connections between Scientology and the Nation of Islam." Quotations adding content, retweets and replies most welcome. 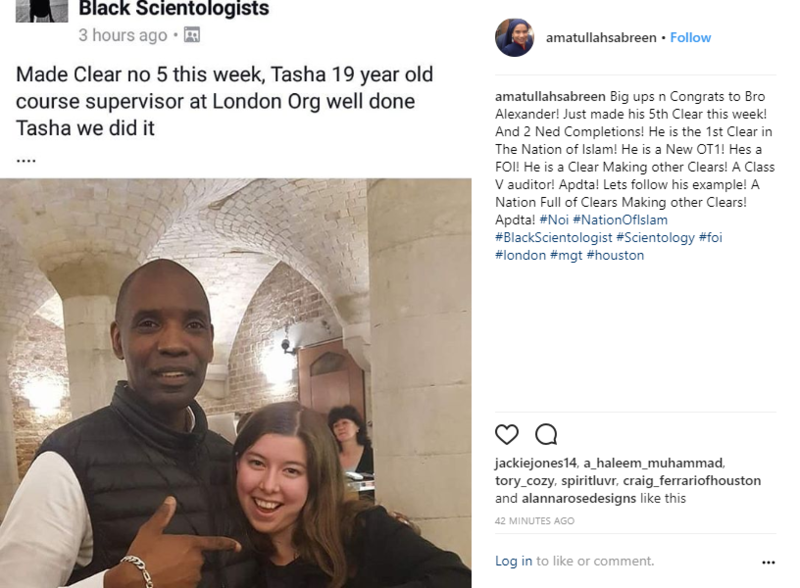 MORE evidence Nation of Islam members are practicing the religion of Scientology: Nation of Islam Brother Alexander Ofori-Muhammad is a Class V Auditor who has audited three people to the Scientology state of Clear. 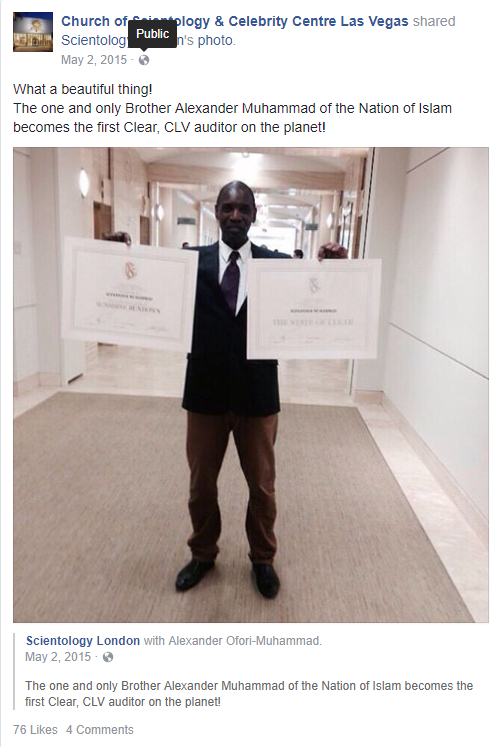 Scientology Class V Auditor Nation of Islam Brother Alexander Ofori-Muhammad has audited his fifth PC to the Scientology religious state of Clear. 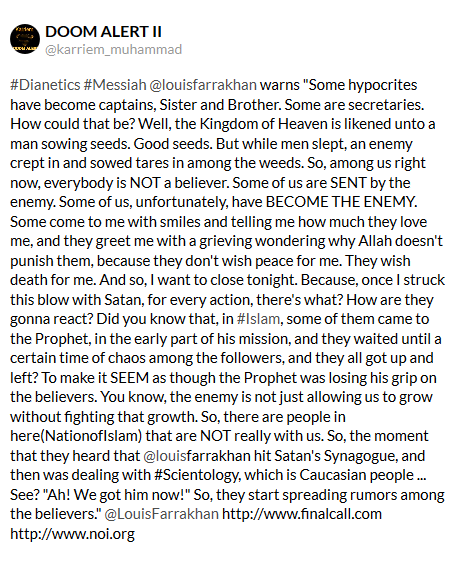 Nation of Islam Minister Wesley Muhammad's view of Scientology on January 17, 2016. Minister Wesley Muhammad is a significant figure in the Nation of Islam. 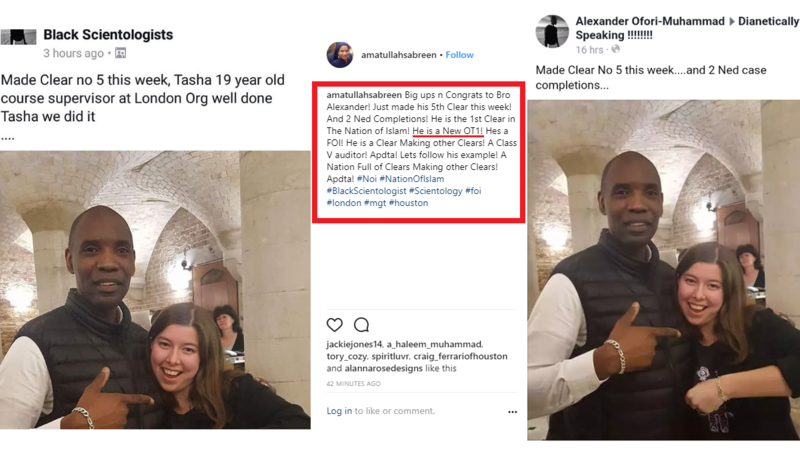 He received a Ph.D. in Islamic Studies from the University of Michigan (Ann Arbor). As I recall, he is member of both the NOI Research Group and the NOI Executive Council.
" 'Scientology is not the language of Islam' what Does that mean?" "It means what the Apostle of God intends it to mean dear Brother. He is not happy hearing Scientology in the language of his ministers." Much Love & Respect sir!!!" "The technology that the Minister introduced us to that can make us better FOI was emphatically NOT Scientology dear Brother. It was the specific technology of Auditing. 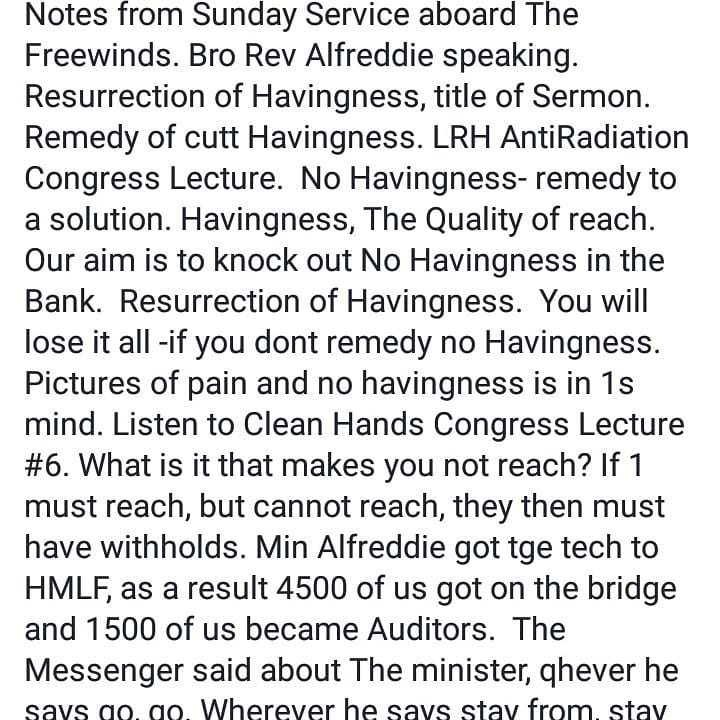 The Minister does NOT want us going over "the Bridge" of Scientology. Much Love and Respect Black God!" 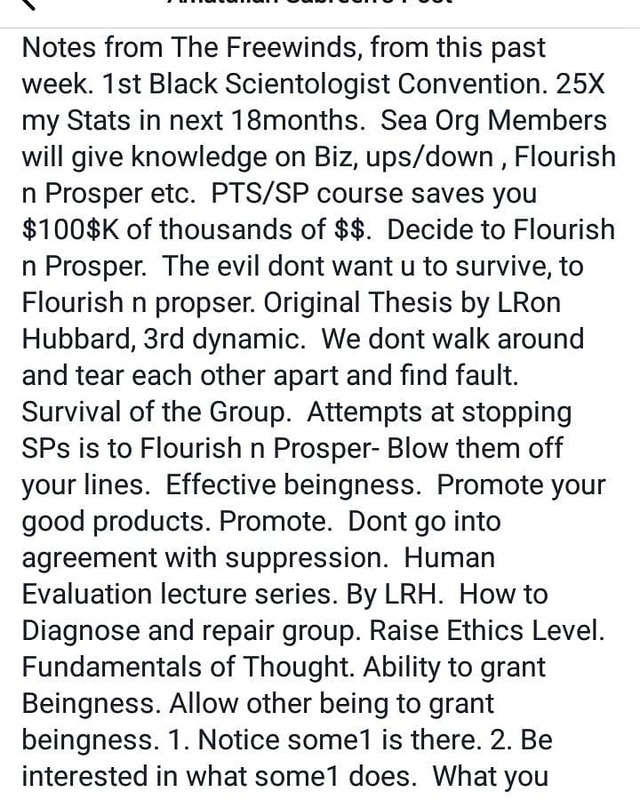 "Question....is there any connection WHATSOEVER between NOI and scientology? I was told that the Minister uses some of their conditioning. I'm asking for myself....thanks in advance." "Thank you for your legitimate question. In seeking ways to relieve the Believers in the Nation of Islam from the tyranny and oppression from his Laborers that had become much too common, the Honorable Brother Minister Farrakhan introduced to his Laborers the particular technique of Auditing innovated by L Ron Hubbard. The Minister felt and feels (knows) that this technique can be helpful in lessening the emotional and thus the psychological burden of those in leadership in the Nation, and in so doing the burden of oppression and tyranny on the Believers would be lightened. The Minister thus required those of us in leadership - and ONLY those of us in leadership - to submit ourselves to this process of auditing. He never necessarily intended it for the non- Laborer, and he never intended any of us in the Nation - Laborer and non-Laborer - to "go over the Bridge" of Scientology, the religion. Nor is he happy hearing the language of Scientology in the preaching of his Ministers. We have our religion, and it ain't Scientology. It's Islam. 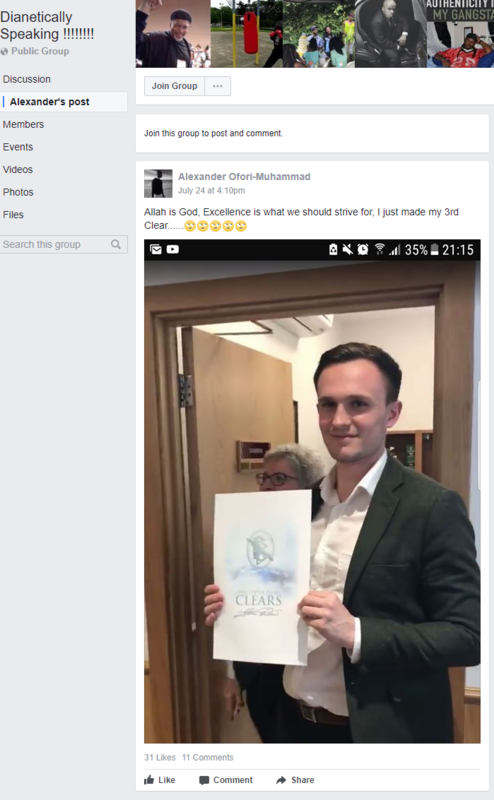 Yes, many Muslims have dived deep into Scientology. But that is simply how THEY do THEIR Islam, and all of us have the right to do our own Islam. 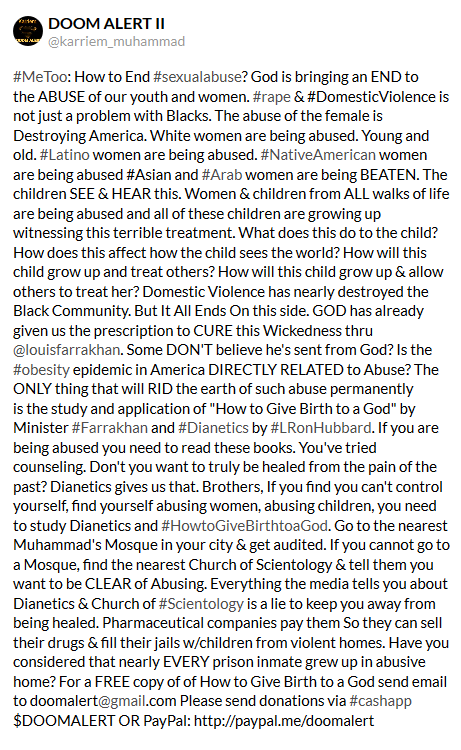 However, that is NOT how Farrakhan does HIS Islam. That is NOT the "Way of the Nation," it is just the way of some of those IN the Nation. I hope that helps dear Sister." "That was clear....your example is no different than FedEx (who I worked for) used military tactics and management to run its company....I got it." 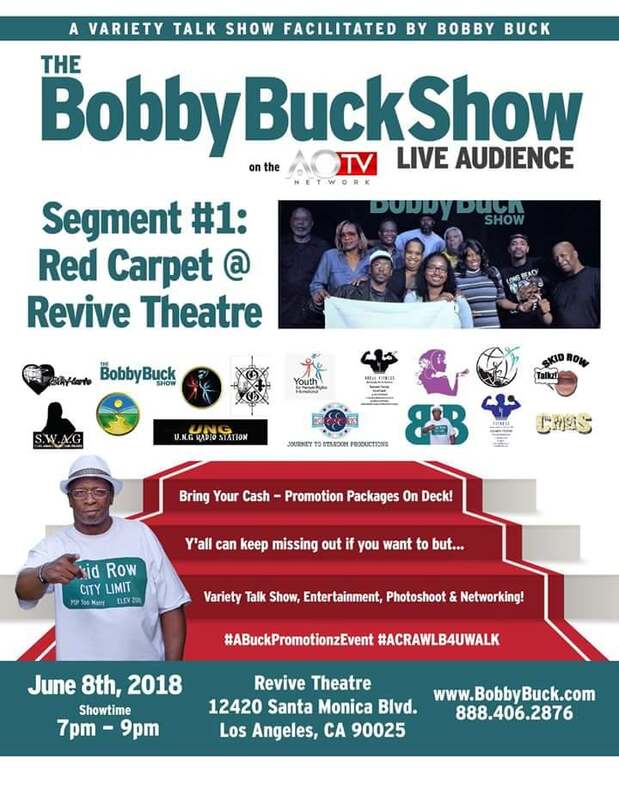 "Peace brother Wesley Muhammad have you watched this video? The Honorable Minister Farrakhan said this technology would help us manifest the Supreme Wisdom Lessons better. Let me know what you think great brother." "Of course I have seen that and the other videos Brother. But my perspective is not based on one or several videos that I maybe have taken out of context. My perspective of the Minister's sentiment is based on being there in person, by his special request, at the first meeting among the Laborers of Islam in which he introduced the technology of auditing to us, his Laborers. My perspective is born from sitting with him over the years since that meeting and hearing first hand his evolving perspective on the Church of Scientology and the impact on the Believers, which he is not happy with. The Minister said in this video what he has said from the beginning: the technology of AUDITING will help us the Laborers manifest the Supreme Wisdom, because unless we his Laborers free ourselves from our (personal) Demons, we can't resist being the Demons over the people that we had become. And we are NOT manifesting Supreme Wisdom properly as Demons. According to his own words the Minister NEVER wanted us - any of us - to go into Scientology. 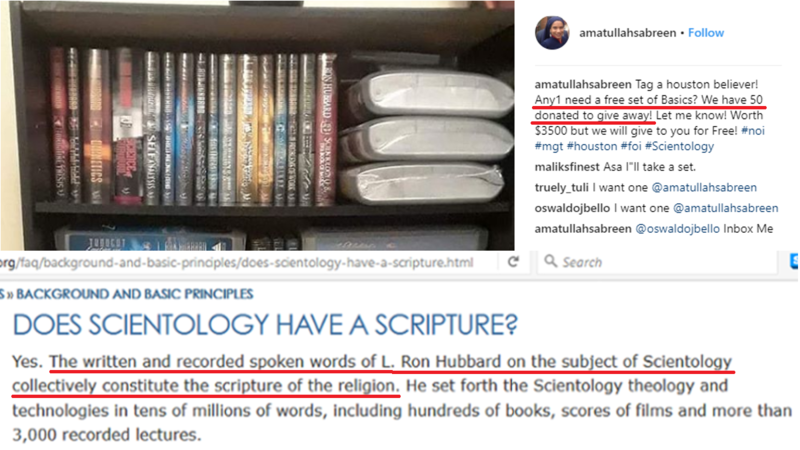 While L Ron Hubbard can be considered a scientist in his innovation of the technology of auditing, with Scientology he started to "make stuff up". As a National Laborer myself I have submitted to the process of Auditing as instructed, and I absolutely see the value in the specific technique and the Wisdom in the Minister's instruction to us. The Minister is not happy hearing the language of Scientology from the rostrum. 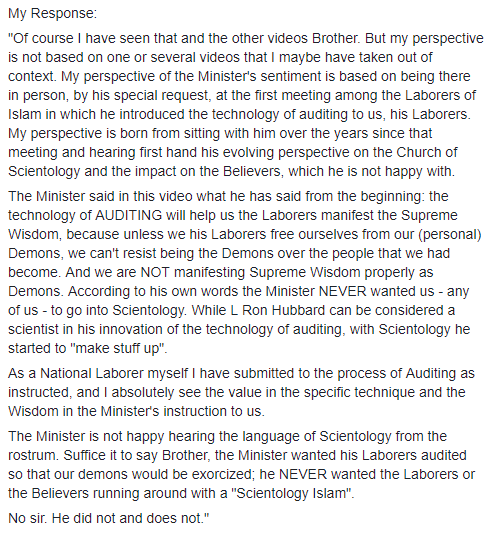 Suffice it to say Brother, the Minister wanted his Laborers audited so that our demons would be exorcized; he NEVER wanted the Laborers or the Believers running around with a "Scientology Islam". No sir. He did not and does not." 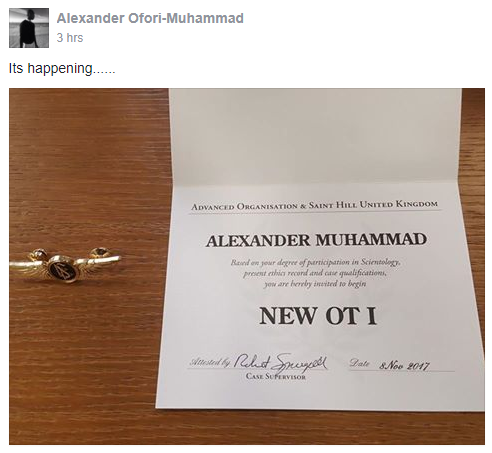 According to Nation of Islam Sister Amatullah Aabreen, Nation of Islam Brother Alexander Ofori-Muhammad is now OT I. He is to my knowledge the first member of the Nation of Islam to complete an OT level. He is also a Class V Auditor and FOI. FOI = Fruit of Islam, the male paramilitary wing of the Nation of Islam. As noted above, he was previously invited to begin OT I.